Thanks to the presence of a large pool of manufacturers, the global wool preservative chemicals market is demonstrating a highly competitive business landscape, find a new report by Transparency Market Research (TMR). BASF SE, Lonza Group, Koppers Inc., Lanxess, Safeguard Europe Ltd., Troy Corp., Rütgers Organics GmbH, Kurt Obermeier GmbH, and Rio Tinto Borates are some of the main participants in this market. The leading players are focused towards expanding their regional reach through mergers, acquisitions, and strategic partnerships. They are also expected to focus on innovations and advancements in their products to gain a competitive advantage over their peers in the near future, states the research report. 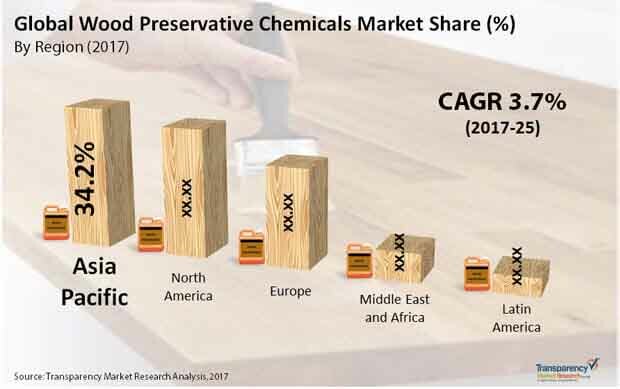 According to the report, the global market for wood preservative chemicals, which stood at US$1.66 bn in 2016, is expected to rise at a CAGR of 3.70% during the period from 2017 to 2025 and reach US$2.28 bn by the end of the period of the forecast. Chromated arsenicals, copper-based preservative chemicals, zinc-based preservative chemicals, and creosote are the key products available in this market. Among these, the demand for copper-based preservative chemicals is relatively higher and this trend is anticipated to remain so over the next few years, reports the market study. The Middle East and Africa, North America, Europe, Latin America, and Asia Pacific are the key regional markets for wood preservative chemicals across the world. Among these, North America has been leading the global market. Researchers expect this regional market to remain on the top over the next few years, thanks to the increased utilization of teak, wood, and other expensive materials in interiors designing, states the research report. “The global market for wood preservative chemicals is witnessing a tremendous rise in its valuation, thanks to the rapid urbanization across the world,” says a TMR analyst. The wave of industrialization is also supporting the global market thoroughly. Going forwards, the rising demand for wooden furniture, globally, is expected to boost the market in the years to come, notes the market study.